The Remco Industries 55AquaJet-ARV pumps are typically used to either draw water from a holding tank and pressurize it, or boost pressure from a low pressure source. Although designed to operate intermittently, many 550 versions can run continuously for several hours at a time. 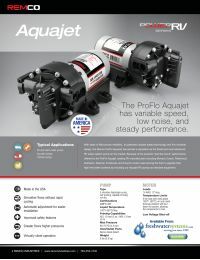 The Remco Aquajet ProFlo Professional Grade 55Aquajet-ARV pumps can be operated either in demand mode (pressure switch controlled) or in delivery mode (controlled by external power switching device). If needed, an integral bypass can be used to limit pressure. CAUTION: Overheating and/or electrical fire may result from improperly sized power supply, wiring, fuses/circuit breakers, switches, connectors and controllers used to power the 12 VDC pump. Digital Controls. This revolutionary water pump features digital controls to automatically control the motor speed and maintain high pressures as multiple water fixtures are opened or closed. Critical New Designs. The AquaJet 5503-AV15-B636 has critical features that separate them from the competition. This pumps features automatic adjustment setting for easier installation, improved safety provisions, and silent operation at low flow levels. Construction. 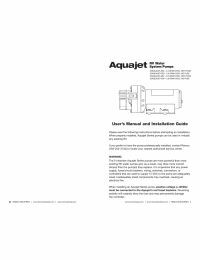 This AquaJet uses a 5-chamber construction that maintains high pressure across multiple outlets, restores pressure lost through water filtration, and works with or without an accumulator tank. Ideal for Recreational & Commerial Applications The Remco Series AquaJet RV pumps are featured in leading RV Manufacturers such as Monaco Coach, Fleetwood, Airstream, Newmar, Foretravel, and Country Coach. Self Priming. The AquaJet 5503-AV15-B636 is self-priming and runs dry without damage. Connections. This pump includes (2) Quad Port 3/4 x 1/2 Male Thread Fittings and features multiple porting options as sold separately, see Quad Port Fittings. 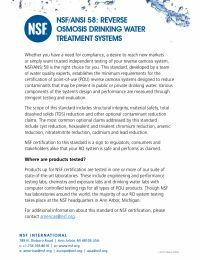 The AquaJet 5503-AV15-B636 meets NSF and IAMPO standard for potable drinking water. Made in the USA. The AquaJet 5503-AV15-B636 is made and manufactured in the USA. Warranty. Remco offers an industry leading manufacturer 2-year warranty.